Advanced Epic Potion Maker | Rollespræll! 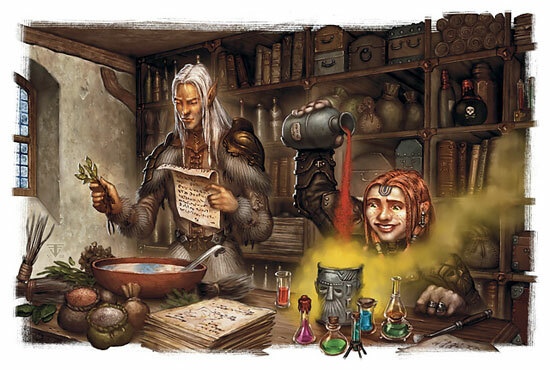 An advanced epic potion maker is able to create potions which are not only epic, but also regarded as epic items. These potions are hard to make, take a long time to research, but once completed, can do almost anything. The base DC of learning and creating a potion is 100. The time spent learning the recipe equals the DC, and the cost is 1.000g per day spent (while the xp gained from learning it is ten times the gold cost). Creating the potion takes 1 day pr DC and the cost is 100g pr day spent (while the xp for creating it equals 1 pr. gold cost). If you fail a learning or creation roll, you get a new roll after DC days, but with a +1 to your roll. Repeat this until you succeed (this means that an advanced epic potion maker WILL succeeed eventually). However, a natural 1 is not an automatic failure, and a natural 20 is not an automatic success. *Wild Shape is a move action, and the new form must be an animal from the MM. On top of your own stats, you add the animal’s AC, movement, hit, damage and MR. You also gain its abilities, attack types, number of attacks, special attacks and special defenses. See also the New Form DC. **Shape Change is a move action and the new form must be from the MM. On top of your own stats, you add the creature’s AC, movement, hit, damage and MR. You also gain its abilities, attack types, number of attacks, special attacks and special defenses. See also the New Form DC. If you decide to make a potion whose powers only manifest while you are Wild Shaped or Shape Changed, the DC of the powers is halved.